Yesterday several former Ducks showcased their talent for NFL scouts at the 2015 Pro Day, the final group evaluation before the NFL draft in April. With several Ducks projected to go off the board on day one, this was their last chance to show teams what they are capable of. 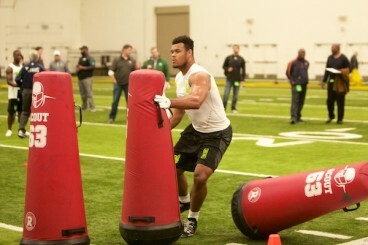 Arik Armstead worked on position drills and one on one workouts with coaches after taking part in everything at the combine. With the intense competition that is the NFL combine and pro day Armstead let us in on how he has been preparing for the next step in his career, “Cardio, I wanted to not look tired” he told us “I’m in better shape, more athletic, faster and stronger… I’ve leaned out a little bit, lifting and running.” That quickness will be crucial at the next level in the every evolving NFL. In order to get ready for that next level Armstead has been working with his brother, a former NFL player. 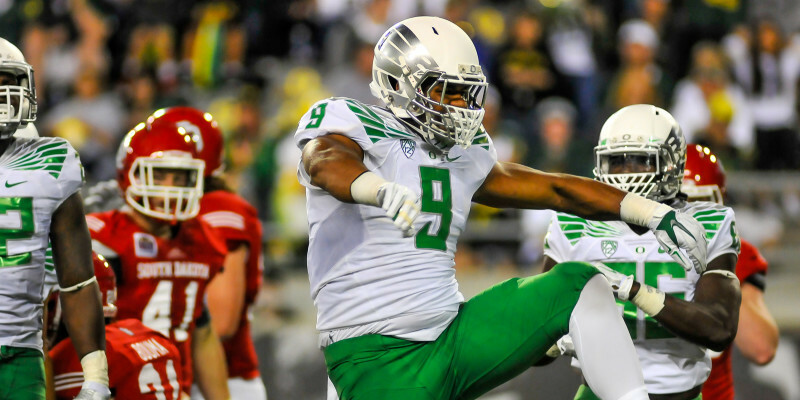 While at Oregon we witnessed Armstead work on the line stopping the run and getting after the passer, with his brother he has been working on more of the same thing, “I’ve been working on my game. Working on getting off the ball rather than waiting for somebody.” A bigger, faster, stronger Armstead is exactly what the NFL scouts are looking for.